His father is of Irish descent and his mother's family is of Russian Jewish ancestry. He began singing and playing piano at the age of eight. He has two older siblings, a sister Neeka and a brother, Joey, also a musician. Growing up in a musical family, he was raised to regard music as part of the fabric of everyday life rather than a remote show-business ideal. As a teenager, Gavin experienced a personal epiphany when he discovered Ray Charles and Sam Cooke, whose combination of personal charm and emotional commitment struck a chord in the budding musician. As a teenager he also played in a local Catskills group called The People's Band with fellow local musicians: Steven Levine on vocals, as well as his brother, Joey. The band played many of the local hotels and clubs around the Monticello area. It was at his brother's advice that he began writing his own songs. Gavin attended Ithaca College on a music scholarship, but found himself spending more time in his dorm room writing songs than attending classes, and dropped out after one semester. He then moved to Boston, where he attended the prestigious Berklee College of Music for two semesters, while singing in a rock band and playing solo gigs on the side. After leaving Berklee and relocating to Manhattan in March 1998, Gavin almost immediately began making substantial career inroads, gradually and organically laying the groundwork for a musical career. "I kept having small successes," he recalls, "just things like applause from small audiences, or people saying they'd heard about me. Those tiny bits of recognition were fuel for me to continue, and made me feel like I was on the right track." Within a few months of his arrival, Gavin made his way into the Ron Grant and Friends open-mic night at Wilson's, the noted upper west side restaurant inside the Lucerne hotel. After wowing the audience, the next day the night manager and talent coordinator Shar Thompson introduced Degraw to the club's owner, Debbie Wilson. Wilson signed on as his manager and almost immediately, word of the talented newcomer began to spread through New York's music community, and the quality of his performances lived up to the buzz. "When I first heard Gavin perform, I turned to Debbie (his manager) and said I need to sign this guy right now, says Randy Sabiston, Senior Director of A&R at Warner Chappell. "Gavin is a truly special songwriter and as a publisher I didn't need to mull it over in my head; it was instant, a no brainer." Early on, Gavin was offered a deal by a major label. Rather than succumb to the obvious temptation, he chose to decline the offer and continue his development as a songwriter and performer, while paying the rent by working as a waiter and newsstand clerk. He eventually signed a record deal with Clive Davis and his J Records imprint (home of Santana as well as R&B mainstays Alicia Keys and Angie Stone). 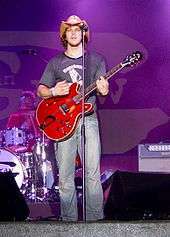 DeGraw rose to fame in 2003, when "I Don't Want to Be" was chosen as the theme song for teen drama One Tree Hill. He released his debut album, Chariot, on July 22, 2003 under J Records. Chariot was recorded at Los Angeles' music studios, Sunset Sound and produced by Mark Endert. Chariot sold over a million copies and earned platinum certification. The album featured three of DeGraw's singles: "I Don’t Want To Be", "Follow Through" and "Chariot". DeGraw's second album, the self-titled Gavin DeGraw, was released on May 6, 2008. Ahead of this, its single "In Love with a Girl" was released on February 12, 2008. The second U.S. single "Cheated On Me" was released in the US on September 30, 2008. This was followed by the Live From Soho album, released on November 7, 2008, featuring mostly tracks from Gavin DeGraw. Gavin DeGraw debuted at No. 1 on the digital sales chart and ranked at No. 7 on Billboard’s Top 200 album chart. DeGraw's fourth album, Sweeter, was set to release on August 9, 2011 but was pushed back to September 20, 2011. The album features many tracks co-written with other artists. The first single "Not Over You" was released on iTunes in June. The track was co-written and produced by Ryan Tedder and was said to be inspired by Kyle Craig. "Not Over You" is his first song to reach the top spot on the Adult Pop Songs. Sweeter contains collaborations from producers including Butch Walker, Eric Rosse, and Ron Aniello; alongside another co-written title track, "Sweeter" with Andrew Frampton. The album was recorded in many locations including Blackbird Studios in Nashville, Walker’s Space in Venice and the Henson Recording Studios. Sweeter is DeGraw's first album released under RCA Records, all three of his previous albums were released under J Records. DeGraw went on to release an acoustic album based mostly on songs from Sweeter. The iTunes Session album features seven tracks and a 30-minute interview. DeGraw's songs have been played on 13 titles in films and on television. "Follow Through" was part of the soundtrack for 2004 film Laws of Attraction, and an episode of Scrubs called My Self-Examination, aired on April 27, 2004. The song was featured on One Tree Hill and on British and Italian TV advertisements for Carte D'or. DeGraw has released a number of music videos as well, including "I Don't Want to Be", "Follow Through" and "Chariot". The latter was directed by Zach Braff, who also directed music videos for Joshua Radin. "More Than Anyone" was selected by fans of One Tree Hill through a Cingular Wireless contest as the first wedding dance song for Nathan & Haley in the 3rd season finale "The Show Must Go On." He and his brother opened The National Underground in December 2007, a New York City music venue that is a roots rock Americana music bar located in Manhattan's Lower East Side, at 159 East Houston Street between Allen Street and Eldridge Street. The venue offers music, food, and drink. The idea for the venue came about because the brothers wanted a place where they could hang out on a regular basis, and where other musicians could come in and listen and learn. "We were picky about the quality of musicians that played there", Gavin DeGraw says. "We wanted a place where the players were so good, other musicians were like, 'Wow! I really respect what they're doing.'" DeGraw was a contestant on season 14 of ABC's Dancing with the Stars which premiered on Monday March 19, 2012. DeGraw and his partner Karina Smirnoff were eliminated from the competition during week 5, following a Dance Duel with cast-mate Jaleel White and his partner Kym Johnson. They landed in 9th place. On February 7, 2013, Carlos Pena, member of the boy band Big Time Rush, announced on his Twitter that Gavin will be guest starring on their same-titled Nickelodeon-show. On February 13, 2014 he made an appearance on Live From Daryl's House with his musical director Billy Norris. On January 1, 2015, he performed between the first and second periods of the NHL Winter Classic game in Washington, D.C.. On January 25, 2015, he performed at the Miss Universe Competition. ↑ "Follow Through" did not chart on the Billboard Hot 100 but did peak at #11 on the Bubbling Under Hot 100 Singles chart, which is an extension of the Hot 100. ↑ "Sweeter" did not chart on the Billboard Hot 100 but did peak at #16 on Bubbling Under Hot 100 Singles chart, which is an extension of the Hot 100. ↑ "Gavin Rossdale Dishes on New Bush Album and a Milestone 20th Anniversary". Yahoo Music. Retrieved September 20, 2014. 1 2 3 "Gavin DeGraw Biography". Gavin DeGraw US. Retrieved January 25, 2012. ↑ "More Than a Memory - The Official Gavin DeGraw fan site". Gavindegraw.us. 2005-04-29. Retrieved 2012-05-09. ↑ "I Don't Want To Be Lyrics". Lyrics On Demand. Retrieved January 25, 2012. ↑ Staff (February 3, 2005). "Gavin DeGraw Speaks Out on Life and Music – His 'I Don’t Want To Be' Is the Theme Song for the Teen Soap One Tree Hill", msnbc.msn.com; retrieved August 8, 2011. ↑ Profile, JDate.com; accessed August 29, 2015. 1 2 3 4 "Gavin Degraw Biography". Artist Direct. Retrieved 7 December 2015. ↑ "Gavin DeGraw profile". Bonnaroo Music and Arts Festival. Retrieved January 25, 2012. 1 2 "Gavin Degraw Biography". ARTIST Direct. Retrieved 7 December 2015. ↑ "Gavin Degraw Biography". Band Biographies. Retrieved 8 December 2015. 1 2 "Amazon: Chariot Gavin DeGraw Format: Audio CD". Amazon Retail. Retrieved January 25, 2012. 1 2 3 4 "Gavin DeGraw Official biography". Gavin DeGraw Official Website. Retrieved January 28, 2012. ↑ "Amazon: Chariot Stripped (Bonus CD) Gavin DeGraw Format: Audio CD". Amazon Retail. Retrieved January 25, 2012. ↑ "'American Idol' Needs To Retire 'I Don't Want To Be,' Whitney Houston And Heart". MTV Website. MTV. Retrieved January 25, 2012. ↑ "YouTube Video: Guy singing I Don't Want To Be in Idol 2009". YouTube. Google. Retrieved January 25, 2012. ↑ "Gavin DeGraw Discography". Gavin DeGraw website. Retrieved January 25, 2012. ↑ "Amazon: FREE Gavin DeGraw Format: Audio CD". Amazon Retail. Retrieved 25 January 2012. ↑ "iTunes Single - Stay". iTunes. Retrieved January 25, 2012. ↑ "Gavin DeGraw Blog". Gavin DeGraw Blog. Gavin DeGraw. Retrieved January 29, 2012. ↑ "Gavin DeGraw Website - Not Over You Release". Gavin DeGraw Website. Retrieved January 25, 2012. ↑ Trust, Gary (January 26, 2012). "Weekly Chart Notes: Adele, Kelly Clarkson, Gavin DeGraw". Billboard. Retrieved January 28, 2012. ↑ "iTunes Session Gavin DeGraw". iTunes. Retrieved January 25, 2012. ↑ Pajer, Nicole (November 28, 2012). "Gavin DeGraw & Colbie Caillat Add Song to Nicholas Sparks' 'Safe Haven'". Billboard. Retrieved February 9, 2013. ↑ "Colbie Caillat & Gavin DeGraw Sing 'We Both Know': Listen". Billboard. December 12, 2012. Retrieved February 9, 2013. ↑ Best I Ever Had - Single by Gavin DeGraw. Itunes.apple.com (2013-06-18); retrieved 2013-08-08. ↑ . neonlimelight.com (2013-09-10); retrieved 2013-09-11. ↑ "Gavin DeGraw & The Script Join Train For Summer Tour". American Top 40 with Ryan Seacrest. Retrieved March 22, 2015. ↑ "Gavin DeGraw to Release "Best Of" Album October 21, Includes Song Co-Written by Harry Styles". ABC News Radio. August 14, 2014. Retrieved August 20, 2014. ↑ "Fire", ITunes.apple.com; accessed August 29, 2015. ↑ "Gavin DeGraw Announces New Album "Something Worth Saving" Out September 9th – First Single "She Sets The City On Fire" Available Now!". RCA Records. 15 July 2016. Retrieved 12 August 2016. ↑ "Gavin Degraw Discography". Gavin DeGraw. Retrieved January 25, 2012. ↑ "Tree Hill Memories: 322 THE SHOW MUST GO ON". Tree Hill Memories. Retrieved January 29, 2012. ↑ "About Us". The National Underground Official website. Retrieved October 5, 2010. ↑ Carlson, Erin (May 8, 2008). "Gavin DeGraw Doesn't Wanna Be Another Singer-Songwriter". The Decatur Daily. ↑ Friedman, Roger (March 6, 2008). "Patrick Swayze Slammed by National Enquirer". Fox News. ↑ "Soul of the City: New York City". Glide Magazine. August 29, 2008. ↑ "Six Seconds with: Gavin DeGraw". New York Post. July 27, 2008. ↑ Tomcho, Sandy (August 15, 2008). 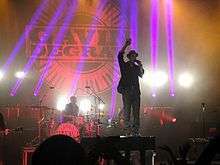 "Gavin DeGraw Performs at Monticello Gaming & Raceway". Times Herald-Record. ↑ Tree Hill 9.13 Songs "One Tree Hill Music" Check |url= value (help). CW. Retrieved 2012-06-16. ↑ 04/18/2012 (2012-04-18). "'Dancing with the Stars' ('DWTS') 2012: Gavin DeGraw Booted After Showdown". Abcnews.go.com. Retrieved 2012-05-09. ↑ "Gavin DeGraw released from hospital after attack, doesn't remember much". WashingtonPost.com. August 10, 2011. Retrieved September 21, 2011. ↑ "Discography Gavin DeGraw". Danishcharts.com. Retrieved June 16, 2014. ↑ "Discography Gavin DeGraw". Finnishcharts.com. Hung Medien. Retrieved June 16, 2014. 1 2 "Gavin Degraw – Music Charts". Acharts.us. Retrieved 2011-11-02. 1 2 "Discografie Gavin DeGraw". Dutchcharts.nl. Retrieved June 16, 2014. 1 2 "Discography Gavin DeGraw". Norwegiancharts.com. Retrieved June 16, 2014. 1 2 "Discography Gavin DeGraw". Swedishcharts.com. Retrieved June 16, 2014. ↑ "Discografie Gavin DeGraw". Hitparade.ch. Retrieved June 16, 2014. ↑ Gavin DeGraw RIAA certifications, published by RIAA. ↑ "Sverigetopplistan - Sveriges Officiella Topplista". Sverigetopplistan. Retrieved September 16, 2016. Click on "Veckans albumlista". ↑ "iTunes Live from Soho – Gavin DeGraw". AllMusic. Retrieved 2011-11-02. 1 2 "Gavin DeGraw: Timeline". Rock On The Net. 1 2 "Gavin Degraw RIAA album certifications". RIAA. Retrieved 2011-10-02. ↑ "ARIA". Aria.com.au. 2011-12-31. Retrieved 2012-05-09. ↑ "RMNZ". Recorded Music NZ. Retrieved 2010-08-07. ↑ "Official Singles Chart UK Top 100 - 26th October 2013". Official Charts Company.